I guess it is time that I finally throw my opinion into the fray….This week, there has been a big “to-do” about the price of Charles Shaw wine (known in California as “Two-Buck-Chuck”) going above the $2.00 mark at retail. So many people have complained that this is the end of affordable wine. Really? Is it that great of a value? At the risk of sounding like a wine snob…it’s not that good of a wine. I use it for making pizza sauce, not for drinking. Again, before you go calling me a wine snob, I have thrown bottles of Charles Shaw into a number of blind tastings, and in every case, it was picked as the worst, or cheapest in the bunch. Again, that was a blind tasting. For those of you who are not familiar with Two-buck-Chuck, it is sold exclusively through Trader Joe’s stores. The wine comes in about six or seven different varieties. 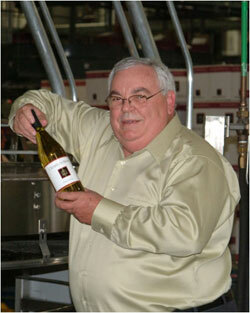 The wine is made by the Bronco Wine Company, whose president is Fred Franzia. You remember Franzia wine don’t you? The stuff that comes in boxes (in fairness, the box wine is no longer associated with the Franzia family, as they sold the business long before Bronco Wine Company was formed). 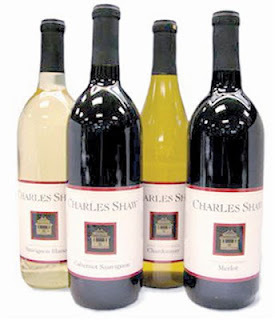 So, who is Charles Shaw? There actually is a Charles Shaw, however he is not involved in the current wine that bears his name. Charles Shaw was an investment banker, who started a winery in Napa in the 1970’s. In 1991, he sold the brand to Fred Franzia. Charles Shaw now operates a winery in Michigan, known as OertherVineyard. Back to Fred Franzia, and the Bronco Wine Company. Fred Franzia is the nephew of Ernest Gallo (think Ernest & Julio Gallo). Fred started the Bronco Wine Company with his brother Joseph, and cousin, John in 1973. Bronco owns vineyards throughout the central valley of California. Land under vine exceeds 40,000 acres. According to their website, they have over 60 domestic wine brands, and over 70 international wine labels. Some of the more familiar would be: Crane Lake, Salmon Creek, Rabbit Ridge, Rancho Sisquoc, Rusack Vineyards, and Red Truck. Bronco Wine Company is the fourth largest wine seller in the United States, behind E. & J. Gallo, Constellation Brands, and the Wine Group Inc. The question arises, “how can they make wine so inexpensively?” Fred Franzia has been quoted as saying that the other guys just overcharge (to paraphrase). Since Bronco Wine Company doesn’t share much information about their winemaking, one can only assume how they cut corners to keep costs down. 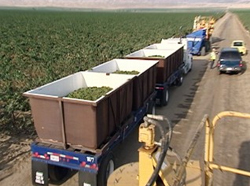 The central valley is typically pretty hot, which means the grapes should produce higher amounts of sugar, which ultimately means more alcohol, and less acid. My guess is that most of the wines are acidified. I would also guess that most of the wine does not see oak barrels, but instead get dosages of oak wood chips, in a process similar to dipping a tea bag into water. Even the bottles on Charles Shaw wine are of lower quality. I know this doesn’t affect the taste of the wine, but it does keep costs down. The corks are shorter than normal corks, and appear to be made of composite cork (pressed cork particles). So, can you produce a quality wine, and sell it for under $3.00? 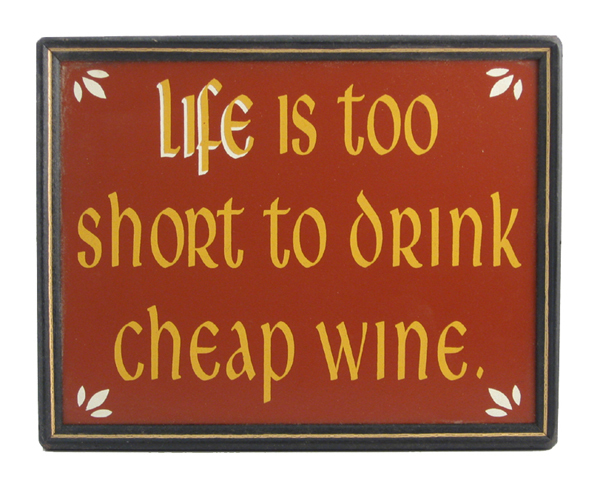 Well obviously, you can produce a wine, whether it is quality is to be determined by the wine drinker. If you like Charles Shaw, great! My hope is that if this opens a door to wine for you, that you will explore further, and see what a $20 or $40 bottle of wine tastes like. To me, there is a difference. Last week, I wrote about Ice Wine. So, this week, I though I would keep the dessert wine theme going, but visit a wine that most people haven't explored, and take a different direction. The funny thing is that most people that have heard of Madeira, think of it as something they cook with. Madeira is one of those wines that has survived through the ages. It ebbs and flows with wine drinkers. Now is the time to rediscover this unusual wine! The "different direction" that I was referring to has to do with how the wines are made. 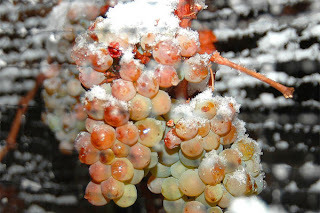 With last weeks ice wine blog, we were talking about cold weather, and how it affects the wine. This time, we are talking about heat, and how it has affects the wine. First off, Madeira is located in the Atlantic Ocean. It is an island off the coast of Morocco, and is part of Portugal. It was discovered by Zarco the Squinter, a Portuguese explorer, in 1419. 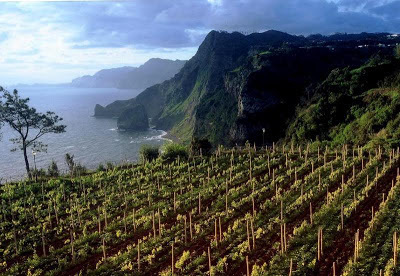 The name, "madeira" means "wood" in Portuguese, as the island was heavily wooded. So much wood, that they couldn't grow anything on it. Zarco had the forest set on fire, to clear some of the brush. Little did he know that it was a volcanic island....the fire burned for seven years. The extensive fire added ash to the soil, which now contributes to the crops that are grown there. Madeira became a main supply port for ships that were exploring routes around the South African Cape. Sugar cane, grains, and wine were loaded into the ships, for travel south of the equator. To prevent the wine from spoiling, they would fortify it, by adding a neutral spirit (now brandy is the spirit of choice). The additional alcohol helped to keep the wine from oxidizing. On the long voyages, the wine would be exposed to heat (crossing the equator) and a constant mixing motion from the rolling seas. 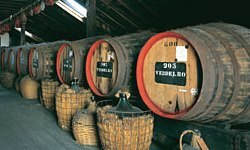 They soon discovered that the wine developed a unique taste, that was preferred to the standard fortified wine. Obviously, the cost of making wine by shipping it all over the world was excessive, so the winemakers came up with a process of cooking the wine on the island, and simulate the affects of ship voyages. The process is known as estufagem. The wines start out just like any other wine. They ferment, and create still wine. Depending on the sweetness level, the fermentation may be stopped by adding the spirits (fortification), leaving residual sugars (the timing of the fortification will determine the ultimate sweetness of the wine). The wines are then put into wooden casks, and heated (in either a room, via artificial heat, or stored in a warehouse that is only heated by the sun). The heating process can last as little as a few months, to as long as 100 years (for the finest Madeira). The wine ages, mellows and oxidizes during this time, mimicking the long voyages across the equator. One of the more interesting aspects of Madeira is that it can be made from five different grapes, four of which will show up on the bottle label, and help you to determine the style of wine. The fifth grape (Tinta Negra Mole) is the most common, and is only used for bulk Madeira...particularly cooking Madeira (which has salt and pepper added). Verdelho - This is an off-dry style of wine, with some residual sugar. Bual - This is a sweet, dessert style wine. It is characterized by a dark color, medium-rich texture, and raisin flavors. Malmsey (actually, the grape is Malvasia, but the bottle will say Malmsey) - This is the sweetest style of wine, and has a dark color, rich (almost syrupy) texture, and strong caramel and coffee flavors. At one time, these wines were extremely popular in the United States. Rainwater Madeira was once the drink of the South. And, a little trivia here....when our Founding Fathers had finished signing the Declaration of Independence, they toasted the occasion with Madeira. 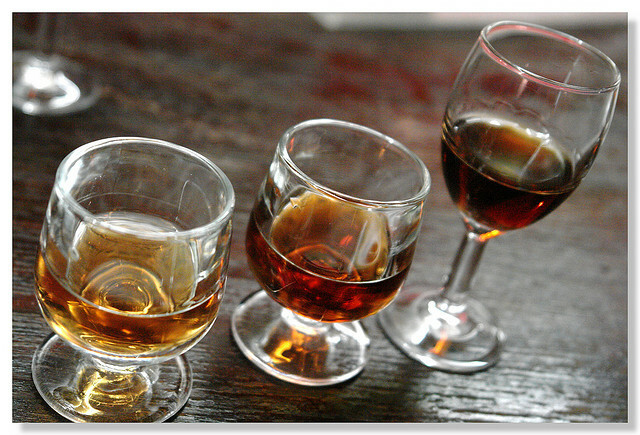 So if you are adventurous, try the Sercial Madeira as an aperitif. The Verdelho can work as an aperitif, dinner wine, or even dessert (all depending on what you are eating). The Bual and Malmsey make wonderful dessert wines (Bual is one of my favorites for apple pie). Here is something else to keep in mind...since the wine has been fortified, and cooked, it has already been "destroyed". You can open a bottle, and it won't go bad on you. Enjoy! "What?" you say. Yep, it is harvest time in Canada and Germany, where some of the best Ice Wine (or Eiswein) is produced. 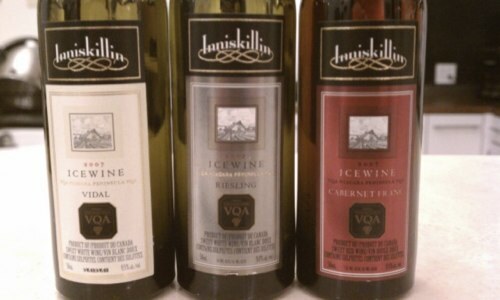 A year ago, I wrote about dessert wines, but only touched on the subject of Ice Wine. 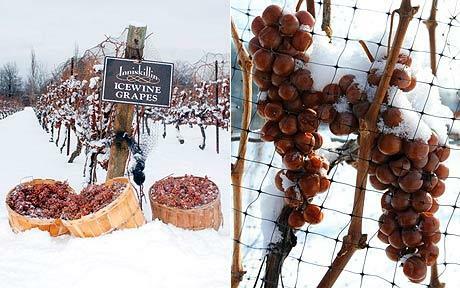 So, this week, in honor of the 2013 harvest, I thought we might take a look at how ice wine is produced. 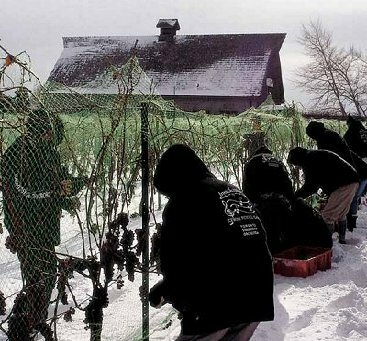 First, there are only a few spots in the world, where it gets cold enough to make ice wine. Canada and Germany of the most likely location, accounting for about 75% of the worldwide production.. But, not only does it have to get cold enough, the growers need a good growing season in the summer months. Ideally a hot summer, allowing the grapes to ripen and build their sugar levels. Next, they need a dry fall, avoiding rot. And finally, they need a cold, sharp winter with consistent temperatures below 15 degrees fahrenheit. Often times, this means harvesting in the dead of the night. All the while, the grapes remain on the vine, exposed to the elements, as well as birds and deer. It can be a real gamble as to whether or not the vintage will be successful. So, why are cold temperatures so important? Well, the idea is to concentrate the sugars in the grapes. When they freeze, only the water freezes in the grapes, leaving a concentrated juice. The brix levels (one degree brix is equal to one gram of sucrose in 100 grams of juice) can reach in the 40's. Normal still wines, are harvested around 24 to 26 brix.. The grapes are then harvested, either by hand or machine, and transported to the containers, and ultimately the press. The pressing of grapes for regular wine is very gentle, but in the case of ice wine, the pressing is much more aggressive, squeezing at high pressure to extract what little juice is still available in the grape. Some times, this can be just a trickle of juice. Since the pressed juice is so high in sugar, we need acid to balance the sugar, and for that reason, we typically see grapes grown with natural acidity: Riesling, Cabernet Franc, and, in Canada ,Vidal (a hybrid). Additionally, the high sugar levels mean that the yeasts involved in producing alcohol, will have a tough time. Fermentation can actually take months, and special strains of yeast are used. Even with the long fermentation, the juice will never fully convert to alcohol, so we are left with a high amount of residual sugar, making a medium to full bodied wine with a slightly lower alcohol level that regular wine. In Canada and Germany the grapes must naturally freeze on the vine to be called ice wine. But, in some other countries, cryoextraction is done, to mechanically produce something similar to natural ice wines. These types of wines are sometimes referred to as "icebox wines". So, now that the harvest is underway, we should start seeing this vintage on the shelf just in time for summer. 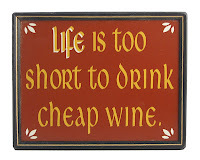 But no need to wait that long, go out and find a bottle of last years vintage at your local wine shop. For my money, the best known producer in Ontario, Canada is Inniskillin. Look for it, and give it a try!